Elder Flower was once described as the “medicine chest of the country people”. It possesses more therapeutic qualities than any other species of elder and all of its parts are useful. Hippocrates used elder bark as a purgative and the green inner bark makes a soothing, all-purpose lubricant ointment. The Elder grows wild in many parts of Europe and belongs to the foklore in a number of countries. The Anglo-Saxons called it Eldrun. Danish legend connected it with magic believing that a dryad lived in the branches. Russian peasants said that the compassionate spirit of the elder would drive away evil and also give a long life. Sicilians thought that sticks made of its wood killed serpents and drove away robbers and the English people believed that the elder was never struck by lightening! The Elder has been used since the days of the Egyptians and most likely before. It was used in certain cosmetic preparations and still is to this day. To heal burns and chillblains an ointment is made from the flowers and the leaves are used in ointments and washes to soothe and repair the skin, treat bruises, haemorrhoids, sprains and can be applied to wounds. In the battlefields of World War 1 an ointment was made to treat wounds and burns. The bioflavonoids in the plant encourage circulation when the flowers are made in a hot infusion and combined with yarrow and mint they are specific for the treatment of colds and flu. 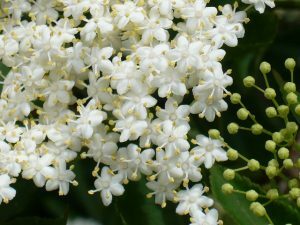 Elder flowers reduce bronchial and upper respiratory catarrh and can be used to treat hayfever. For an eyewash for conjunctivitis, a cold infusion of the flowers is effective. Elderberry wine is mildly laxative and diuretic and relieves sciatic, rheumatic and arthritic pain. A cold infusion of the leaves dabbed on the face is advised to repel insects (such as mosquitos and flies). Can be combined with Peppermint, Yarrow or Hyssop for colds and fevers. For influenza combine with Boneset. For catarrhal states, mix it with Golden Rod. Contraindications: Should not be taken in any condition that would be worsened by further drying or fluid depletion. The Bark is not to be used during pregnancy as it is a strong purgative.